← This Sector Stalled, Is The Rally Over? While stocks continue to defy the law of gravity… so does my PnL. Now, I’m not showing you these numbers to brag. But because I have too. You see, I teach ordinary people how to trade stocks. And in order to prove what I teach works, I trade real-money and live stream my trading account in real-time. …It’s having skin in the game. I’m primarily trading stocks under ten bucks. Which means you don’t need a lot of money to get started. To keep things easy, I focus on three specific chart patterns, identifying a catalyst, and finding value. It’s exactly what I teach my clients too. T.D. : Thanks to everyone for a brilliant start to my trading career. 14K profits in my 4 week of going live with real money. C.G. : JB I’m new, when you say pivot in the email this am what do you mean? This stuff works. 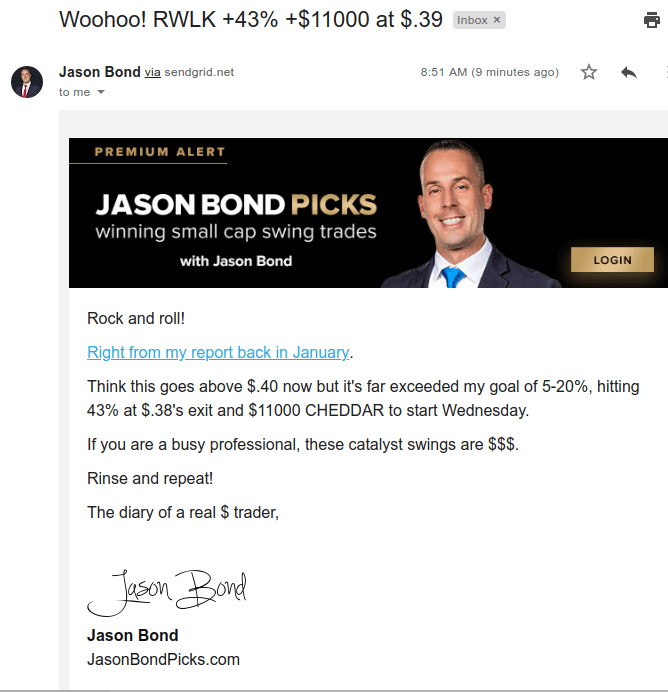 And to prove it to you… I want to show you exactly how Millionaire Roadmap clients (some rookie traders) and myself were able to bank on one of today’s hottest stocks. The reality is patterns, value, and catalysts work. If you’re able to identify patterns and key areas of demand and supply, you could sound trading decisions. Moreover, when you position yourself and look for catalysts, it’s not crazy to see your positions gap up 25%+. For example, check out the daily chart on ReWalk Robotics Ltd. (RWLK). Does this pattern look similar? You see, I focus on three patterns – this pattern in RWLK is known as the Fibonacci retracement (what I call the rest and retest). It’s pretty simple. 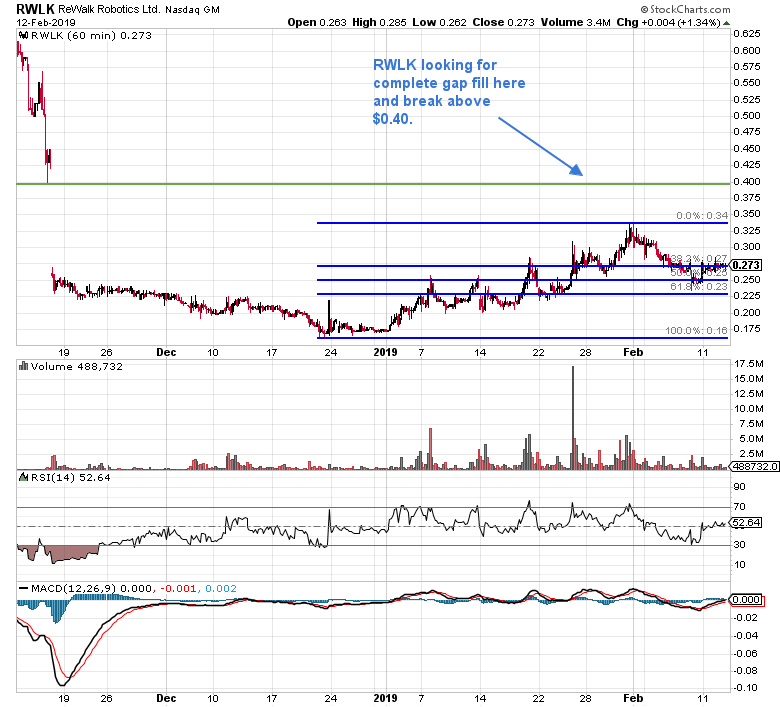 I wait for a stock to have a strong run up, just has RWLK did. Thereafter, I identify areas of value. You could’ve used $0.25 or $0.23 as buy areas. The reason for these prices? Those are areas of value. You see, looking at the Fibonacci retracement lines, those are areas of support, or demand. In other words, traders are willing to buy at the support (demand) area. In turn, this would drive the stock higher… you could clearly see the stock had a tough time breaking below 23 cents. So what was the process here? Find the right chart patterns and what works for you. I like to focus on my three patterns – oversold (fish hook), continuation (Fibonacci retracement or rest and retest), breakout (rocket). Identify areas of value. That means buying at clear support or demand areas and taking profits before it reaches an area of supply. Be aware of catalyst events. You see, I’ve already completed two of the steps in my trading process. The next step is the catalysts. My thinking was this was related to the government shutdown, and once it starts operating normally… this stock would explode. Once You’ve Conducted Your Due Diligence… It’s Time to Fire. Now, there was plenty of time to get into the trade and game plan. Once I saw its price and volume increase, I was stalking the stock. 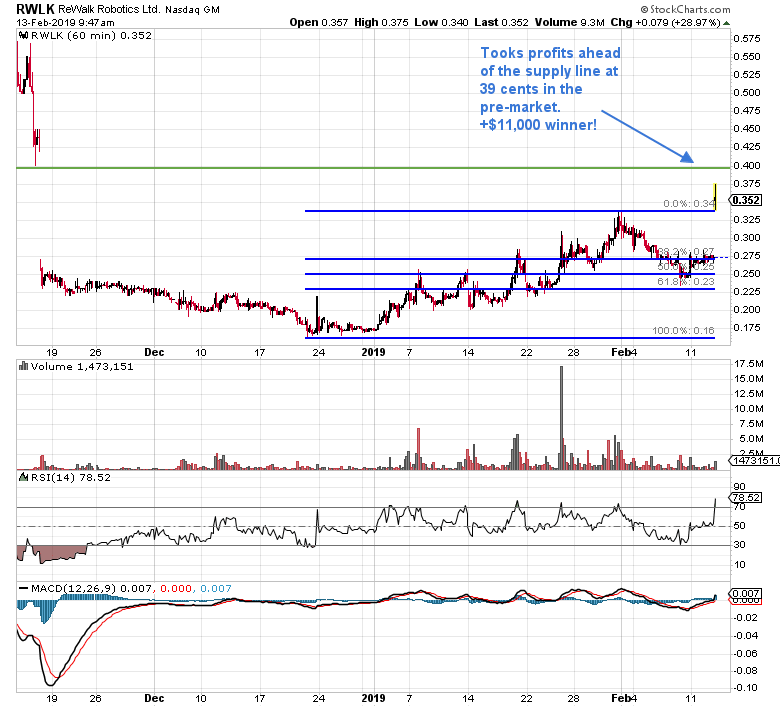 Here’s the chart I was actually looking at ahead of this trade. Not too long after, I was locking in +43% in profits, well above my expected goal of 5-20%. Could I have held the stock longer in hopes of making more money? Of course. Now, I know I thought it could break above 40 cents. However, if you really break the trade down… it exceeded my profit expectations significantly, and it made sense to take $11,000 in profits. Of course, if you want to see how this all works in real-time, click here to gain access.